So. I was thinking about cowgirls. Whaaat? I was thinking about cowgirls and remembering a picture I found of my father as a young man. He was dressed, all six feet plus of him, in full cowboy regalia.He had on the fringe shirt, the pants, the boots, and a holster with two fake six guns at his hips. He had on a cowboy hat, and his hands were at his hips with both thumbs hooked onto the holster. Tough guy. Cowboys. A symbol for me, at that age anyway, of tough goodness. Righteous goodness. The courage to take on the bad guys and make the world a better place. That was a theme in our household. Make the world a better place. It came from the cowboy. As a child, I wanted—so badly—to take on the bad guys. And in our world of make-believe, we did just that. My sister and I were among the few girls in our neighborhood who pretended to be cowgirls. If our brothers got cap guns, my sister and I got cap guns. If our brothers got cowboy hats…You betcha. My sister and I got cowboy hats. Now, for sure, we were pretty feminine girls, schooled in many of the traditional tasks girls with southern roots were expected to learn. We embroidered. We crocheted. We made dresses with crinolines and large brimmed hats for the dolls that Mom sold to make extra money. We learned to cook — and I mean cook: perfect pies and cakes, succulent roast beef with biscuits and gravy. We put up vegetables and fruit in big Mason jars. There wasn’t a lack of things for good girls to learn. But there was something exciting—creative—about things the boys got to do. Things like building model airplanes and navy aircraft carriers; things like putting together trains and train tracks. I loved that stuff. And for a moment— just a moment—I thought I would join the Armed Forces when I grew up. I can still feel the tiny pieces of gray plastic and the cellophane numbers for the ships beneath my fingers. I can still smell the powder from the cap guns. Do they still sell cap guns, I wonder. Do children today know how to pretend? It seems like so many children who should be pretending are shooting for real these days. Where is the power of imagination and make-believe? I wanted to be a cowgirl. 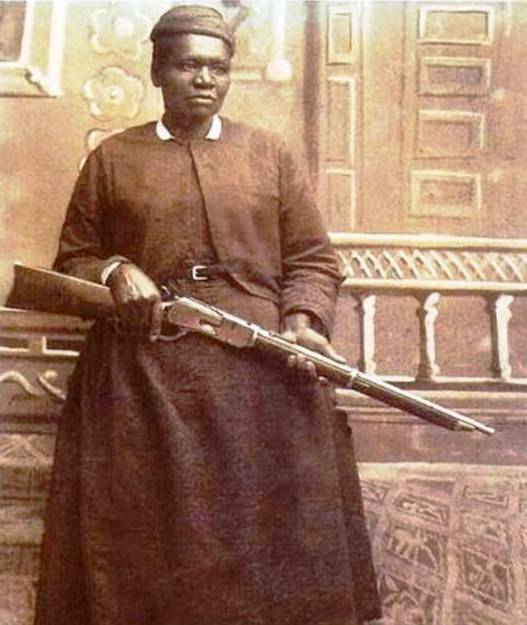 A cowgirl had righteous business to take care of, and she took care of her business: Annie Oakley and Stagecoach Mary (one of the few historically documented black women of the old west). I’d bet my cowgirl holster and two cap guns that neither of those women ever picked up an embroidery hoop. Today, I don’t own, nor do I want to own, a pistol—not even a cap gun. I, my sister, and so many others still have a cowgirl’s heart. We want to make the world a better place. And while we may not actually be cowgirls, we are heroines in our ordinary lives, changing things daily and making the world a safer, kinder place. There is righteous business to take care of, and we can take care of business. Posted in African American, Creative Non-Fiction, Essay, Life Stories, Memoir, values and spirituality, Women, Writing. Loving.